"The LORD saw how great man's wickedness on the earth had become, and that every inclination of the thoughts of his heart was only evil all the time." "but where sin increased, grace abounded all the more..."
Trevor (Haley Joel Osment) devises a plan to change the world. He calls it "paying it forward." The plan is simple: Bestow a major act of kindness on three separate people on the condition that each of these people go and bestow a major act of kindness on three other people. Each one of these acts has to be "something huge," as Trevor puts it, or something these people could not have done for themselves. Pay It Forward is a brilliant illustration of grace in action. Grace is deliberate, active, infectious goodness. In a similar way as Trevor, Christ set off a chain reaction by making a few men into agents of God's kingdom. Jesus' condition for receiving His Spirit is also similar to Trevor's condition: Christ-followers must go out and love others extravagantly, with the same fervency that He loved them. As was stated several times in Pay It Forward, the world is (poo). Or more specifically, humans left to themselves are evil. But heavy doses God's grace, which Christ injects into the hearts of a few unsuspecting subjects, keeps us from annihilating ourselves. If Jesus didn't continually flood the world with his refreshing mercy, we would swim around in our own hopeless puss-pools of evil. Apart from Him, everyone would be dedicated to inventing new forms of evil. But there is something that offsets our passion for evil... that is Christ's overwhelming passion for God's glory. His grace empowers us to understand that goodness is, in fact, good. As we follow Christ we can learn to yearn after what is good, godly, healthy, praiseworthy and beautiful. 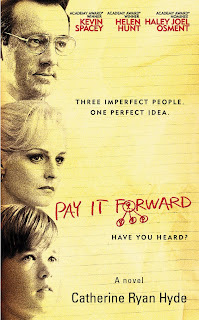 Pay It Forward stars Kevin Spacey as Eugene Simonet (Trevor's teacher), Helen Hunt as Arlene McKinney (Trevor's mother) and James Caviezel as Jerry (Trevor's first test subject for paying it forward). Patrick, have you seen my favorite film of religious allegory, Whistle Down the Wind, ? Great movie, just had a talk with a kid at the bar about this. He asked me why I help everyone out so much even though I am just a bar back. I told him its like this movie and his eyes lit up. "I just saw that! Good call!" Definitely one of those movies that makes you think about how different we could really make the world if we tried.